With proper care and maintenance, you can extend your Thermowood deck’s age and keep the decking in the best condition. Read our advice on how to clean, restore and maintain a Thermowood deck. Is it mandatory to treat Lunawood’s Thermowood decking with terrace oil? The surface treatment of the terrace extends the life of the decking and improves the use of the terrace, so we recommend the surface treatment. With brown pigmented oil it is possible to preserve the brown tint of the wood, otherwise the Thermowood decking will turn grey in time, because of the UV light. How often the decking needs to be treated? The terrace is recommended to be treated immediately after installation so that the surface is immediately protected from moisture and dirt and no separate cleaning is required before handling. The service oil of the decking should be done every two years or more often depending on the conditions and the use of the terrace. How do I surface treat my Thermowood decking? We recommend using a pigmented or coloured terrace oil, as clear oil gives protection to the surface, but does not prevent the wood from greying. If the goal is to have a silver grey terrace, it is also suitable to use a bright terrace oil. Other accessories should be selected according to the surface treatment manufacturer’s instructions. Black spots have appeared on the surface of the decking. How can I get rid of the spots? Air impurities such as soot or pollen in the air sometimes might cause small black spots on the surface of the decking. In some cases strong decking base (iron particles) combined with water can colour the wood. You can prevent black spots by using pigmented decking oil right after installation. The black spots will mostly disappear over time as the boards turn grey, if the decking is left untreated. 2. Wash and clean the surface using a spot removal liquid (for example Tikkurila Tehopesu or similar). Rinse well and let the surface dry. If the surface has a clear film after washing, remove it before continuing. 3. Grind using a fine sand paper if needed. 4. Oil the decking 1-2 times with pigmented decking oil using a thin brush or sponge. Spread evenly and with continuous movement for the entire lenght of the board to avoid overlapping. Wipe excess oil off immediately. Apply the next layer after the previous one has dried. How can I get the same oil as used in Lunawood’s preoiled decking boards? 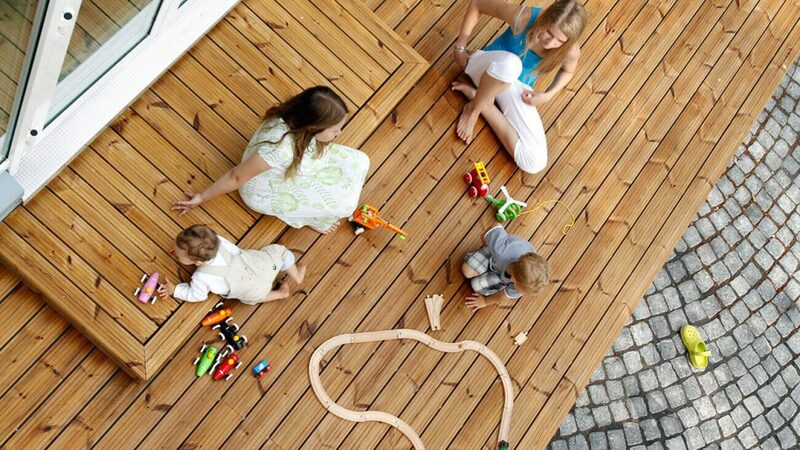 Lunawood’s factory oiled decking boards have been treated with AkzoNobel terraceoil. Unfortunately, the product is not yet available directly from the hardware store.